What is the processing fee for education loan? Processing fees is the upfront fees charged by the education loan provider to the applicant. There are the following types of processing fees. Refundable processing Fees signify that the processing fees would be adjusted during the disbursal of the loan. It however, does not signify the return of the processing fees, in case the loan is rejected or the loan is not availed. This is provided by Bank of baroda. 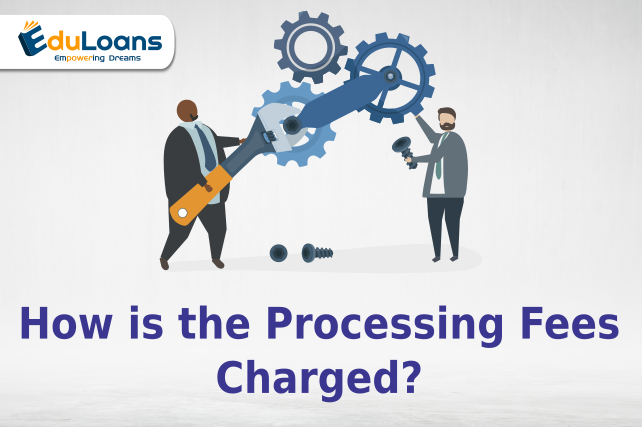 Non-refundable processing Fees are the processing fees that are charged for the process and cannot be returned, irrespective of sanction, denial etc. This is provided by SBI, Axis and all NBFC. Amortized Processing Fees Certain financial institutions, in which case, they do not charge any processing fees upfront, do an amortized processing fee. However, it is not that there are no processing fees. The processing fees are added as an additional percentage, over and above the interest rate offered per year, during the tenure of the loan. They generally have the concept of Annual percentage rate (APR). Annual performance rate (APR) is the addition of Interest rate plus the processing fees amortized. This is provided by international funds like Mpower and prodigy. No processing Fees means that there is no charge for availing the loan. However, we would request you to read the fine print as there could be issues for recalling the loan or a fixed lock in period for the loan. US banks generally charge no processing fees. The most economical in processing fees is Bank of Baroda as the entire processing fees is refundable. ← What is the interest rate flexibility offered by education Loan? How much time does a overseas education loan provider take to process an education loan? What is the interest rate flexibility offered by education Loan? What are the pro and cons of taking insurance with education loan? What are the girl child benefits while availing education loan? Which financial institutions provide benefit to the girl child?